Oliver is attacked by Vigilante while acting as mayor. Diggle leads the team on a mission to stop Vigilante once and for all. City Council starts impeachment proceedings against Oliver. Felicity has become addicted to hacking and goes so far as to join the hacking group Helix. Dinah is able to get a piece of Vigilante’s helmet. Curtis uses T speheres to track down Vigilante. Diggle,Curtis, and Rene go after him. They stop him from shooting Oliver. He is able to get away. Susan Williams returns and knows that Oliver is Green Arrow. He neither confirmed or denied when she asked in their previous conversation. Thea resigns as Oliver’s assistant after what she and Felicity had done to Susan Williams. Oliver holds a news conference and makes Green Arrow public enemy #1. 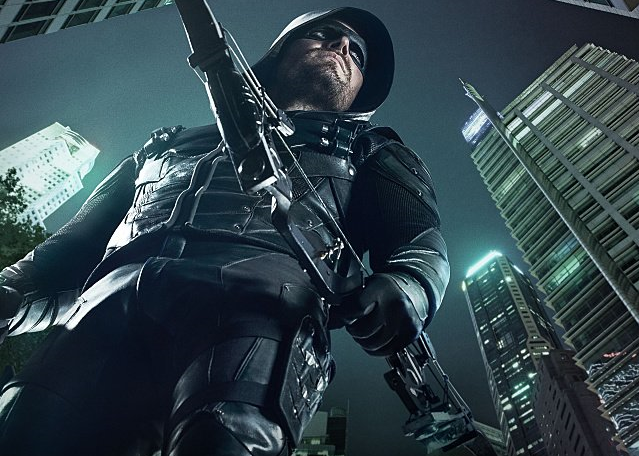 Oliver faces impeachment after the news about Green Arrow’s involvement in Detective Malone’s death comes out and that he helped to cover it up. In the end, Oliver is not impeached. Prometheus makes an appearance. Interesting to note is that Prometheus’ identity is revealed before Vigilante’s. Prometheus is Adrian Chase. Chase was at the top of my list for being Prometheus. It is going to be interesting how the rest of the season plays out now that Oliver will know who Prometheus is in the next episode. Adrian goes after Susan. He tells her she’ll want to hear what he has to say because it’s a matter of life or death. Next week’s episode Oliver gets closer to the truth about Prometheus. Helix refuses to help Felicity until she does a favor for them.